Tire Service Program Boosts Dealership’s Bottom Line - Iowa Mold Tooling Co., Inc. : Iowa Mold Tooling Co., Inc. When Gary Henry realized that his family’s business was the biggest customer of the town’s tire dealership, he started to think maybe it was time to keep that money all in the family and to make a little profit while he was at it. “We pretty much kept the local tire dealer in business, so we decided to go into the tire business ourselves,” says Henry, who is co-owner of Henry Bros. Implement Inc., which is a three-part business: they are a Case International dealership that also has some farming operations, and they also are a tire dealership that provides field service for their customers. Henry Bros., which has three locations in northeast Kansas — Hiawatha, Holton, and Seneca — got started as an agriculture equipment dealership back in the late 1960s, and by the time the ’70s and ’80s rolled around and agriculture got a little tougher, the Henry family realized they needed to supplement their business with something that would draw a steadier income and wasn’t so seasonal. Because ag tires go hand-in-hand with their main product line, it seemed like a natural decision to get into that business as well, but they didn’t want to stop at merely selling tires. Henry Bros. also saw the value in providing field service for their customers. The Henrys bought their first tire service truck from Iowa Mold Tooling Co., Inc. (IMT) in 1984, and they’ve purchased three more over the years. Although Gary Henry says the tire side of his business is only about 10 percent of Henry Bros. bottom line, he’s very glad they made the decision to get into tires. The income is much steadier, and they provide an invaluable service to the farmers of northeastern Kansas. In fact, Henry Bros. tire service program has grown to the point that they essentially have the market cornered for their region. “Our ag equipment competitors aren’t really willing to venture into tire service because we have become so well-established in that regard,” Henry says. And they wouldn’t have been able to grow the tire portion of their business without their IMT farm tire service trucks. “The trucks are awesome, everything about them is awesome,” says Brent Henry, tire manager for Henry Bros. “I’m so happy with them.” Gary Henry says that customers in their area more or less fall into their lap because downtime due to a blown tire is so detrimental that there’s really no alternative to having someone come out to the field and fix it immediately. “Plus, we’ve been in business for more than 35 years, so people around here know where to go and know that we can get the job done,” Gary Henry says, adding that they are able to get their customers’ tractors up and running again in the same day about 99 percent of the time. Brent Henry says that when he first started in this business, the common ag tire was small enough that he could manage field service without using a crane. That’s not the case today. IMT Predator tire service trucks are meant to service and haul large tires. 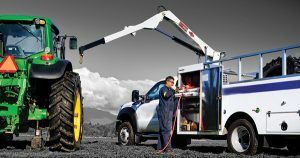 The vehicles include tool storage, a rotary screw air compressor, and a crane that is mounted to the center of the chassis for lifting tires and other equipment components. Because Henry Bros. offers 24-hour tire service in the northeast region of Kansas, from Topeka all the way up to Nebraska, Brent Henry says the IMT trucks — along with their IMT bead breakers and tire tools — are pretty much in use all the time, every day. “We put 18,000 miles on our newest Predator truck in its first year, and that’s a lot considering the area we’re covering,” he says. Brent Henry says he has continued to purchase IMT trucks as his business has grown not only because he loves the product, but also because he appreciates the quality of the IMT distributor network. “The fact that service is good and it’s local has kept me coming back over the years,” Henry says.